I was very excited this morning to wake up to the new Crown Crates! One of the first items that caught my attention was the Ancestor Moth Swarm, a non-combat ‘pet’ of Moths that follow you around, sweet! This is great news, as it opens up the possibilities for Non Combat Pets to flying creatures. I know previous ES games had Luna Moths, Blue & Orange Butterflies, Dragonflies and Bees. I’ve seen articles of a Torchbug pet which has already been datamined. I am looking forward to a day where we can have bats and birds as pets! Back to my outfit, I tried to create a Moth Priest when I first created this site in January, but ended up putting the idea aside as it just wasn’t coming together. 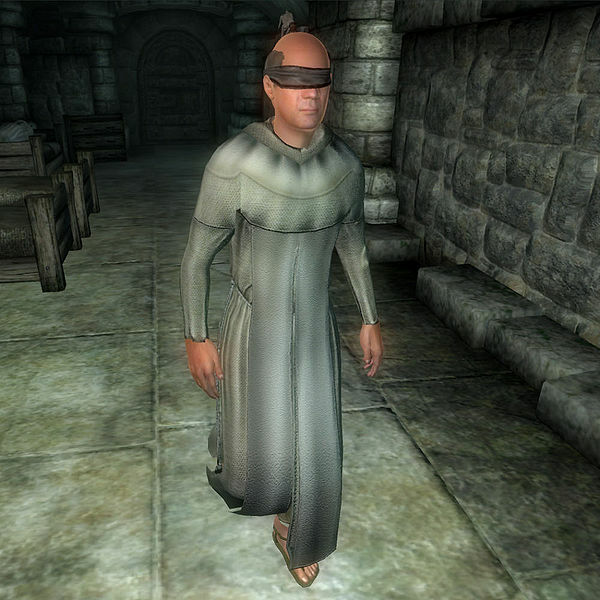 This Blind Moth Priest outfit is based from the outfit from Oblivion shown above, where they look a lot more like Monks than the new Moth Priest outfit found in the Wild Hunt Crown Crates. This entry was posted in Elder Scrolls Lore, Imperial, Matching Pet, White Outfits, Worship Wear and tagged Ancester Moth Swarm, Balding but Distunguished, Master Gold, Poet's Stubble, Soul Shriven Ragged Clothing.